I was in the kitchen at home this weekend, with a stained and well-loved cookbook balancing precariously on the edge of my counter, a bit of smoke in the air from a stove burner making an acrid plea for cleaning. I didn’t mind: the weekends are when I have the time to be more flamboyant with cooking, and here among the smoke and stains and undersized countertops it all felt cheerfully ritualistic. I was making a couscous salad with dried figs, snap peas and za’atar dressing. My scrawled margin notes said it had turned out too salty the last time, and so I decided to make the za’atar from scratch instead of resorting to the powdery claret-coloured stuff from the store. I started to pull the ingredients together – I had sumac in the cupboard – and then I paused and made a face, looking at the page: it called for hyssop, and I didn’t have that, and didn’t know what it was, but the word sounded in my memory with a familiar hiss. I leafed through my school notebook from the previous week, and there it was: Hyssopus officinalis, the hyssop plant. We had sampled a series of tinctures in our first Herbal Production and Processing class, and hyssop was the last one, one we had dwelled on. 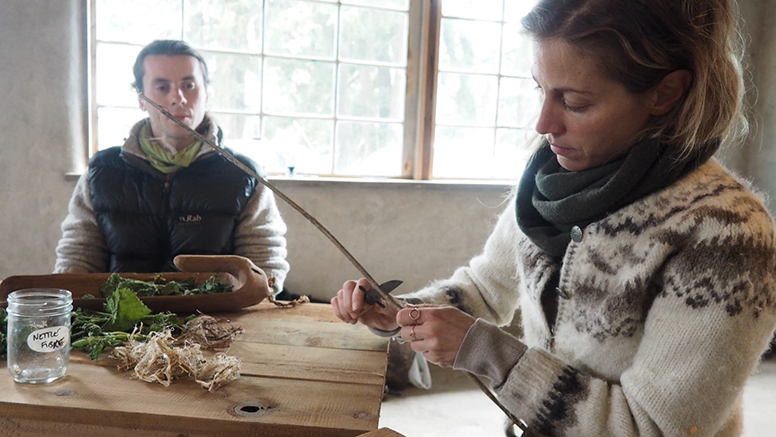 Slicing a dried nettle stalk to access the inner fibre. The stalks are best harvested late in the season, when they have grown tall and woody. Once the fibre is separated from the stalk, it can be braided into cordage. I remembered it, astringent and camphor-like on my tongue. We’d been sitting outside in the grass, trying tinctures out of a big case with the legend printed on the back of the lid like a box of Pot of Gold chocolates. Hyssop is known for being antispasmodic and antimicrobial, a “lung herb” that’s useful for treating respiratory conditions. Energetically, it’s considered to have purifying and protective properties. But here it was, absent any of this therapeutic context, two tablespoons’ worth called for in my salad dressing. I thought about the blog from last week, when I talked about our class “foraging for plants as food, not specifically as medicine”, and realized that I was making a false distinction: food is medicine. For that matter, plants can be both food and medicine, but also, if wrongly identified or prepared, can be poison – together comprising what ethnobotanist Nancy Turner calls the “food-medicine-poison triangle”. And so a nota bene from last week, one to add to the wild harvesting ethics we’re learning (only take as much as you need, and only take that which is given; never take the first or last; ask permission; never take more than half; the purpose should be worthy of the harvest): if you’re foraging, it’s of paramount importance to properly ID the plants before diving in. 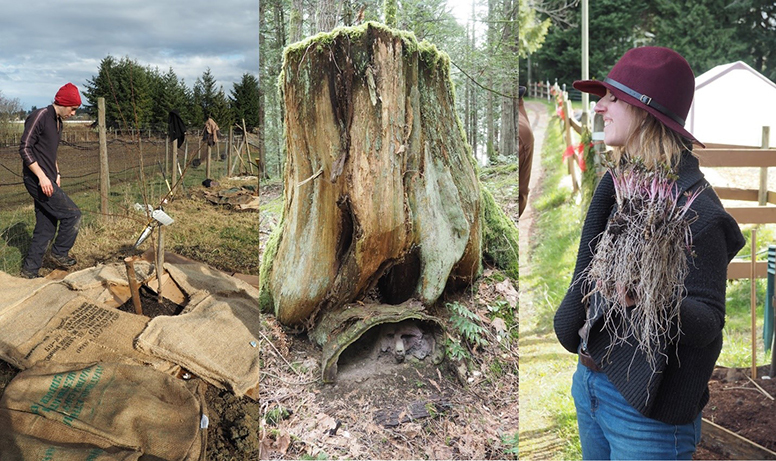 (L-R: Jute coffee sacks used as a weed barrier for mulching around freshly planted fruit trees; a black bear carving peeking from under a stump at ȽÁU, WELṈEW̱ (Mount Newton); Solara, our Perennial Plants instructor, holding a bunch of skirret (Sium sisarum), a perennial vegetable known for its sweet edible roots and a favorite of the Roman Emperor Tiberius. Now in the kitchen, I was hesitantly navigating the food/medicine corner of this triangle. Lindsay, our instructor, had specifically focused during our first class on common culinary herbs that are also medicinals. She explained that in a first aid situation, for example, it’s helpful to know how to work with herbs that most people have on hand. But I realized that even then I’d been unconsciously reinforcing this binary approach, tagging off the plants one-by-one in my mind as either food or medicine – with mint and rosemary falling into the former camp because that was how they were familiar to me. Seeing hyssop in the spattered black-and-white of a recipe book – mentally a “medicine” plant, two drops of tincture taken in the tabatière between my thumb and forefinger the week before – upended this reflexive categorizing. I’m glad I caught myself. It’s an attitude, I think, that deprives us of a more holistic understanding of and relationship with plants. Lindsay had encouraged us in class to be open to multiple ways of knowing: gaining familiarity with these herbs by using intuition, for example – something that we all possess, but which might not be well-cultivated in everyone. This idea sits well with me, but I also hear the familiar echoes of a tug-of-war between competing approaches to knowing that sometimes plays out in my mind, probably picked up through a kind of cultural osmosis. In some ways this turns on an impulse to privilege that which is plainly measurable and replicable over that which might be amorphous, contextual, or ephemeral. Discussing base maps with Tayler in our Design Methods, Process and Mapping class. We created working designs of the area around the pond at Ravenhill Herb Farm, reimagined as a publicly accessible “world garden” with cob buildings and some whimsical flourishes. In this way, I think, there are some links with this approach to holistic healing and our broader permaculture program. By Capra’s thinking, the ecological, social, and economic crises that can serve as individual flashpoints in our world are not separate, but rather a common product of a failure of imagination, or a collective crisis of perception. 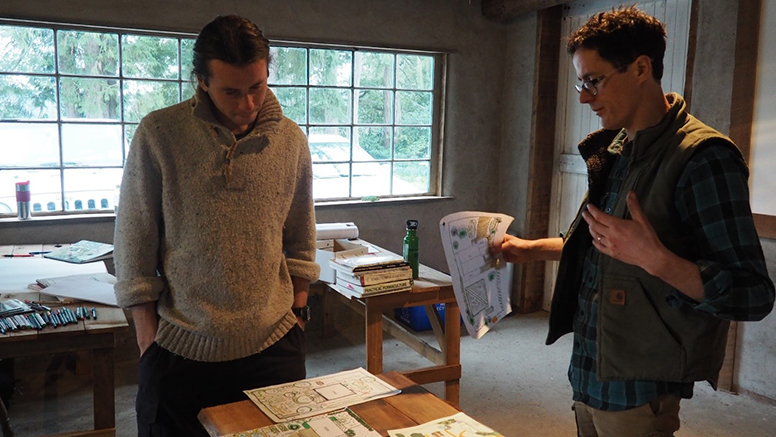 In seeking and mapping the “hidden connections” we encounter – whether it be the energetic qualities of the plants that we engage with or the relationship between place-making and planet repair that we intuit, ecological medicine and permaculture offer tools for undertaking the task. 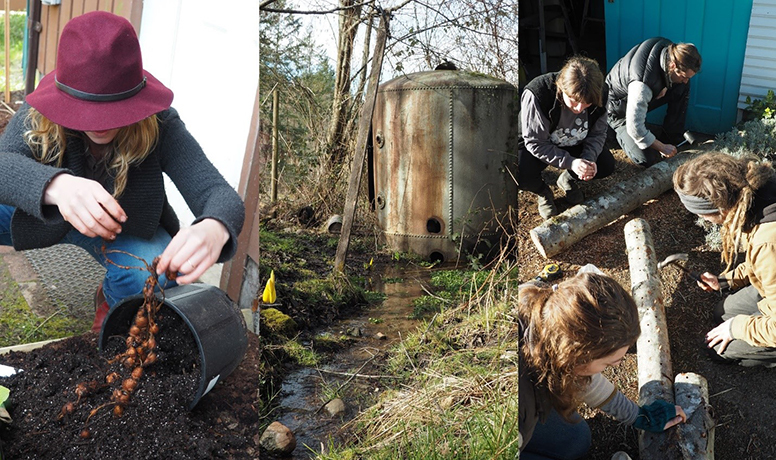 (L-R: Solara unearthing a groundnut root (Apios americana), a nitrogen-fixer and insect attracting perennial native to eastern North America which has edible seeds, seed pods, and tubers; the pumphouse at Tiny Tree Herb Farm, with swamp-loving skunk cabbage (Lysichiton americanus) visible in the left of the frame; inoculating logs with shiitake mycelium plugs at Ravenhill Herb Farm. Anyway, my week was bookended by experiments in the kitchen, the second part occurring in the roomier environs of the classroom kitchen at Tiny Tree. We were making tinctures with Lindsay, and I was pulsing some dried meadowsweet (Filipendula ulmaria) in a coffee grinder and watching the smallest particles jump with each repetition and drift around under the tinted plastic lid. Meadowsweet is known for being an anti-inflammatory and anti-rheumatic, good for reducing fevers and soothing the stomach. I put the ground herb in a jar and covered it with a solution of alcohol and glycerine, jotting down my math . Once it has macerated for a few weeks, the plant material (called the “marc”) can be strained out – and I’ll have a tincture to contribute to the herbal first aid kit for our classroom. Maybe I’ll contribute a good za’atar recipe while I’m at it, too.